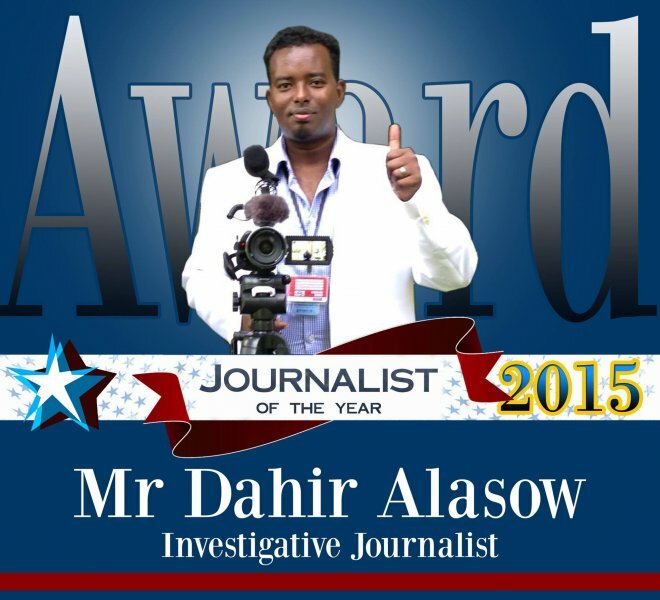 Dahir Alasow the best journalist of the Year 2015. Dahir Alasow surprisingly became the best journalist of the year (2015) of Somalia when it comes to investigative journalism and arts that he produced for the last ten years. It is these skills that Somali Independent media learned before we had recognized his influential role that he plays in the Somali society. Using his own Website, Waagacusub Media, Mr. Alasow has been speaking for the rights of the voiceless people and It is his researches and talent that he published thousands of articles following genuine investigations and exposed many hidden terrorism activities, corruption and injustice among the Somali Federal government, the terrorist groups of Alshabab and Alqaeda as well as their financial supporters. He wrote many songs that highlight the best of the Somalia stories, love and many other subjects related to life. The likes of (Go’aan) decision, (Baadigoob) search, (Hayaan) explorer etc. The names of his songs definitely represent the messages that they send to the Somali communities. Therefore, we are glad to announce that we have recognized Dahir Alasow the Investigative Journalist of the year (2015), which means that he is the best journalist in Somalia for the year 2015.